The police investigation into the infamous robbery outside LIC Branch Office last week has stirred up yet another controversy with some Akali and Bahujan Samaj Morcha leaders accusing the police of ‘unnecessary’ harassment of the leaders and workers in the case. At least seven persons were injured when a local mini bus lost control and rammed into an auto-spare parts shop at Gill Road today morning. There are half a dozen top Punjab militants who are believed to be settled in Pakistan for the past 10 years. 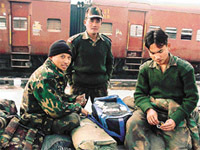 Undeterred by the war clouds that seem to hover over the horizon, brave Indian soldiers are as cheerful as ever. Millions of countrymen had celebrated the New Year with a hope that year 2002 would bring prosperity and happiness in their lives. Day: January 1; time: around 4 pm; place: a roadside tea shop in Focal Point; scene: four men, seated on a couple of wooden benches, were having tea, exchanging New Year greetings and generally cursing the chilly weather. The Vice-Chancellor of Punjab Agricultural University, Dr Kirpal Singh Aulakh, has been nominated member of the Standing Policy Planning Committee of the Indian Council of Agricultural Research (ICAR). The committee is headed by Dr M.S. Swaminathan, former Director-General, ICAR, and Secretary with the Government of India. Stung by the recent spurt in crime incidents in the city, the district police has re-launched the controversial tenant verification scheme. While earlier landlords were required to furnish details about their tenants and face criminal charges in case they did not do so, now the police was going from door to door to record details about the tenants. The Bharatiya Janata Party (BJP) has formally laid its claim to the Ludhiana West and four other assembly segments in Punjab, from where it wants to field its candidates in the forthcoming elections. Final round of talks between the leaders of the Panthic Morcha and the Bahujan Samaj Party will be held at Jalandhar tomorrow to decide about seat sharing for the ensuing Vidhan Sabha election in Punjab. While, the local prospective Congress candidates are lobbying against each other for party tickets in Ludhiana, they also have to battle candidates from outside. 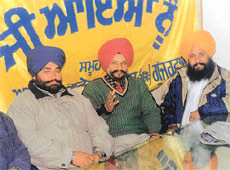 They fear that the party might field some “outsiders” from some important constituencies in Ludhiana. The ruling SAD has suffered a major setback as several Shiromani Akali Dal Youth Wing workers joined the Lok Bhalai Party. When the country is preparing itself to launch a decisive war on terrorism, the city has lost one of the remaining few INA fighters, Capt A.S. Wadhera. He had participated in social campaigns and tried to provide a helping hand to the needy. A new committee of the International Dharam Parchar Council (IDPC) was formed here today at a meeting held at Gurdawara Mastuana Sahib, Model Town, under leadership of chairman of the IDPC, Sant Shamsher Singh Jogaera. Citizens dealing with banks — particularly those who had to take loans against security deposits in the form of property etc — today expressed their sense of hurt and annoyance at the attitude of certain conciliation officials of banking institutions. 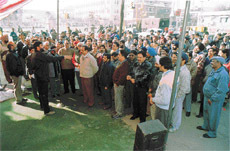 The local unit of the Punjab Bank Employees Federation (PBEF) held a dharna in front of Canara Bank, Bharat Nagar Chowk, here today in protest against the ‘vindictive attitude’ of the management of Standard Chartered Bank. Mr Naresh Gaur, secretary of the Punjab Bank Employees Federation, addresses a rally in Ludhiana on Wednesday. Akash Bansal belongs to a new breed of entrepreneurs who have established their mark in the world of business. Basically an engineer, he preferred his family business of knitting and hosiery and accepted the challenge of dealing only in ladies woollens. The Sadar police has booked a driver, Jasbir Chand, a resident of Bhamian village, under Section 283 of the IPC for parking his truck opposite a dharam kanda on the GT Road and jamming the traffic on Monday. 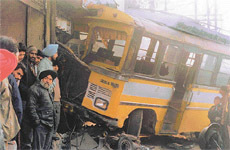 Three persons were reportedly killed and seven others were injured in two road accidents near here in the past 24 hours. While interviews of kids for admission to schools are just one month away, parents are putting up their best efforts to get their wards admitted to the schools of their preference. The District Consumer Disputes Redressal Forum has quashed a Punjab State Electricity Board (PSEB) demand of Rs 62,147 from Mr Balraj Kumar, a resident of Santokh Nagar. Kabaddi teams from England, Canada, and the USA along with major outfits of the region will be seen in action during the Gujjarwal Sports Tournament to be organised by the Amarjit Grewal Club at Shree Guru Hargobind Sahib Stadium at Gujjarwal village near here from January 4 to 6. Mr Pavitter Singh Grewal, chairman of Amarjit Grewal Club, makes a point during a press conference in Ludhiana on Wednesday.